Running for fitness can be a good part of a fitness routine. It is more intense than walking or jogging. Therefore, for some, it may be an activity that is done from time to time as a way of increasing intensity for brief periods. Although there is the potential for injury, as there is in any sport, there are many benefits in running. There is the potential for weight loss, improved cardiovascular fitness, increased muscle mass, increased bone density, and an improved mental state. It is an activity, like all forms of regular exercise that can have an impact on reversing or slowing the effects of aging. Running can help people to get in shape. But you have to make sure that you gradually increase the intensity slowly, depending on your fitness level. 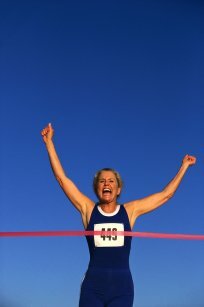 Some people may think that seniors can’t participate in running as a sport or fitness activity. The truth is that seniors can run as long as they work up to a more intense level of exercise. In fact , there are individuals who actually run in the senior Olympics well into their 7o’s and 8o’s. For those that are interested in taking their training to a higher level, running could be the answer. Be sure to discuss your training with your doctor to see if you are able to exercise at that higher level. Seek out events and programs that you can participate in as a senior athlete. If you choose and are physically able, you can benefit from running for fitness.